Undefeated Russian Murat Gassiev retained his International Boxing Federation cruiserweight world title Saturday with a spectacular third-round knockout of Krzysztof Wlodarczyk Newark, New Jersey. 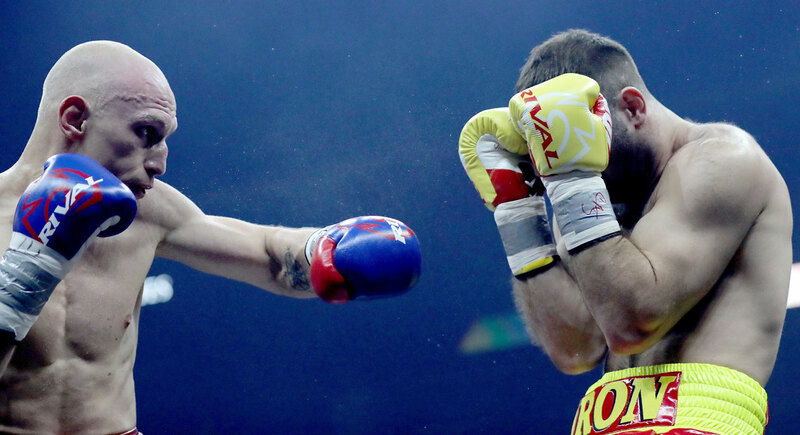 Gassiev followed a left uppercut to the head with a brutal left hook to the body that put the two-time world champion from Poland down for the count at 1:57 of the third round. “I had a great chance and I used it,” said Gassiev, who was making his first defense of the title he took in December with a split-decision victory over Russian southpaw Denis Lebedev in Moscow. The bout was a quarter-final of the World Boxing Super Series tournament, and with the victory Gassiev — who improved to 25-0 with 18 knockouts — set up a semi-final against unbeaten World Boxing Association champion Yunier Dorticos of Cuba. Dorticos was on hand for the bout, and came into the ring when it was over, his own belt draped over his shoulder. In other world title fight action Stateside on Saturday, unbeaten featherweight Alberto Machado of Puerto Rico scored an eighth-round knockout of Jezreel Corrales to claim the World Boxing Association super featherweight belt. He was ineligible to regain it on Saturday, but that proved moot as Machado recovered from a fifth-round knockdown to seize the title, improving to 19-0 with 16 knockouts. Machado came back from the knockdown to hurt Corrales in the sixth and in the eighth he produced a combination that knocked out the Panamanian at 2:15 of the round.